First Listen: Trent Reznor & Atticus Ross, 'Gone Girl (Motion Picture Soundtrack)' Gone Girl is Reznor and Ross' third soundtrack collaboration under the direction of David Fincher. As with their past work together, the music suits the story that inspired it perfectly. 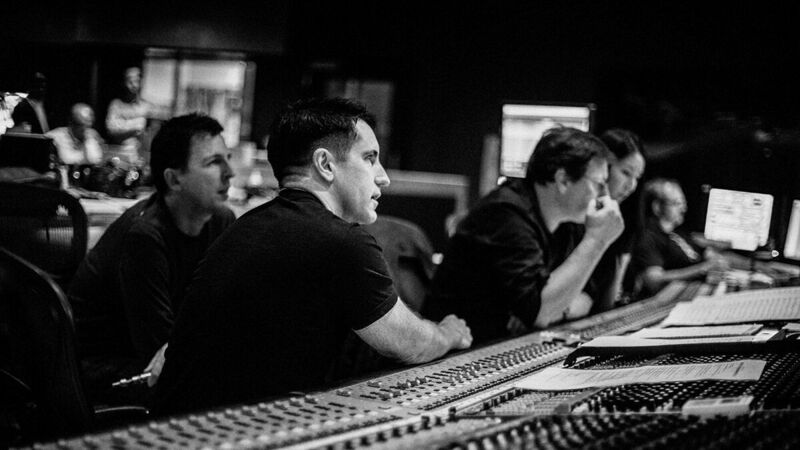 Trent Reznor and Atticus Ross' soundtrack to the film Gone Girl comes out Sept. 30. When British musician, film composer and audio engineer Atticus Ross found his band 12 Rounds signed to Trent Reznor's now-defunct Nothing Records, it proved to be a windfall for both artists. While the 12 Rounds album Reznor helped produce was left unfinished, Ross soon found himself working within Nine Inch Nails as the group experienced an early-21st-century renaissance, starting with 2005's With Teeth and stretching to the present. Around that time, director David Fincher found himself cutting an early version of his 2010 film The Social Network to NIN's disquieting ambient album Ghosts I-IV, then convinced Reznor and Ross to record his film's music. Awards and accolades have followed. Gone Girl marks the third soundtrack collaboration between Reznor and Ross with Fincher, a synthesis of cinema and sound that's starting to prove as fruitful as those of Alfred Hitchcock and Bernard Herrmann, Sergio Leone and Ennio Morricone, or Akira Kurosawa and Toru Takemitsu. While The Social Network's Oscar-winning score teems and throbs like overstimulated thought and The Girl With The Dragon Tattoo (which won a Grammy) pulses with icy drones befitting its heroine, Gone Girl again fits its story's mood to perfection. Only this time, the plot focuses on married couple Nick and Amy Elliott-Dunne and their seemingly placid life in the suburbs of Missouri. As Fincher recently told The Wall Street Journal, he found himself getting his back adjusted at a spa and had a revelation: "I was listening to that calming, placating music and thought, 'We need to tap into this.' The movie is about the facade of the good neighbor, the good Christian, the good wife." So the Reznor/Ross score skates across that placid surface with its gorgeous opening theme. For the early part of the soundtrack, gentle, New Age-esque themes like "Sugar Storm" seem to drift past unperturbed. But no matter how relaxing these motifs might sound, there's always a shadow just beneath the bright surface. What can start off sounding like a picnic in the park quickly reveals a black sky. With the carefully crafted tones of Reznor and Ross, sparse and quiet themes soon deteriorate, turning barren and desolate in "Background Noise." Ambient beauties like "Appearances" materialize along the way, while the piano-led "Just Like You" might be Reznor's most beautiful and fragile melody to date. But when the piano becomes submerged in electronic noise — as in "Secrets," "Still Gone" and the thunderous "Consummation" — the duo's motives become more evident. Reznor and Ross relish being at their most beauteous, knowing that it'll make the brutal moments of Gone Girl all the more harrowing.